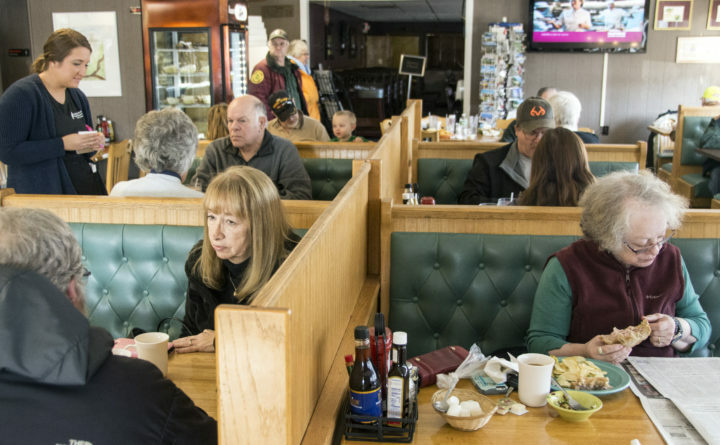 Sue Dennison [left] listens to her husband Bruce while Jeanne Peacock [right] finishes lunch at The Bluebird Ranch Family Restaurant on Friday. Jeanne Peacock discusses Gov. Paul LePage's closure of Downeast Correctional Facility in Machiasport during lunch at The Bluebird Ranch Family Restaurant on Friday. MACHIAS, Maine — Gov. Paul LePage’s unannounced closure of Downeast Correctional Facility in Machiasport on Friday has left many different kinds of businesses in eastern Washington County without workers. A human resources manager at the Lobster Trap, Carol Geel saw the prisoner transport buses and Maine State Police teams that had arrived at the prison at 4:30 a.m. Her company, a wholesale seafood dealer, lost eight work-release employees — a third of its workforce — at its Machiasport facility, she said. In a surprise early Friday morning operation, the LePage administration moved 63 prisoners from Machias to facilities outside Washington County. Some had as recently as Thursday worked at local businesses, said Jeanne Peacock, whose husband, Bob, is a prison advisory board member. Half the prison’s inmates typically participate in the program, said JJ Tibbetts, a correctional trades instructor at Downeast. Work-release inmates paint churches and schools, do carpentry and road repairs, lay out boat docks at state parks and make inmate clothing. Twenty percent of their wages goes back into the state’s General Fund, Tibbetts said. 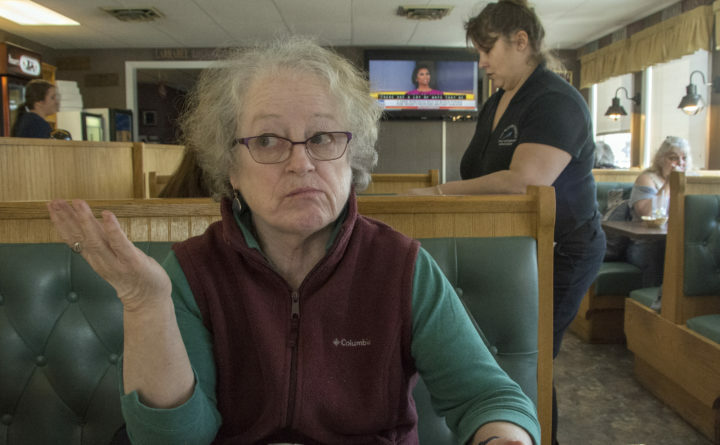 Susan West, chairwoman of the Downeast Board of Visitors, was among several residents who criticized LePage for the sudden, secret nature of the closure, which included security aircraft overhead. Cutbacks had reduced the prison’s staff from 80 workers, Tibbetts said. Bruce and Sue Dennison of East Machias said they were baffled by the closure. LePage had said for years he would shut the facility, but recent statements by state legislators made that seem unlikely, they said. “I think it’s sad that one person has the power to close a facility like this,” said Sue Dennison, who co-owns Roy Toys, a wooden toy manufacturer, with her husband. The prisoners employed at Lobster Trap earned $12 an hour, same as other employees, and were good workers. The business, which also has facilities in Addison and Steuben, has used the work-release program for six years, Geel said. The inmates were a good resource in season, when 15 to 25 would be hired as part of a staff of 60, but even better in wintertime, when other workers would seek layoffs, Geel said. Her business’ no-nonsense drug policy scares away many employees, she said. This year’s crew was the best yet, with one inmate whose pledge to stay on possibly threatened by the closure, she said. He was taken from the prison on Friday despite having only 18 more days to serve, Geel said. Geel hopes the inmate can return to Machiasport when his term is up but she isn’t sure she should count on it. “We don’t even know where he is,” she said. BDN staff writer Jake Bleiberg contributed to this report.